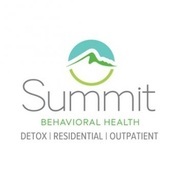 "Summit Behavioral Health aims to provide a solid foundation for addiction recovery, and to improve overall quality of life for individuals with substance abuse and related mental health issues. To achieve this mission, our professionals utilize an integrative treatment approach that incorporates the best clinical practices and evidence-based treatment strategies available in the addiction field." Our drug and alcohol abuse and addiction programs range from detox treatment to long term addiction recovery. We are here to help you understand all of your options and help you with every step of the way.